In the video “Om Namah Shivaya”, I noticed that Maa uses the thumb and index fingers to move the mala. I have heard that index fingers are not to touch the mala. Can Swamiji please comment. That is the method that Shree Maa uses to worship Shiva. But the important thing is not which finger you use, but that you do the japa. So many people waste so much time debating which finger to use, that they do not perform the practices. Generally, there are vegetarians and non-vegetarians. There is nothing “Forbidden.” It is just a question of the practices one observes. Vaishnavas forbid. Shaivites and Shaktis request us to use our discrimination. I would like to know what we can do at home for Navaratri, especially if there are offerings we can make to Shree Maa. http://shreemaa.org/drupal/node/300 . You can offer all that you do to Shree Maa. Especially the food that you cook with mantra, offer with mantra. The other functions you perform can be accompanied by mantra. Picture her image in your mind, and conceive that you are doing for her. Does the link http://shreemaa.org/drupal/node/300 mean that we make 3 offerings – one for the month, one of the lunar day and one for the day of the week ? 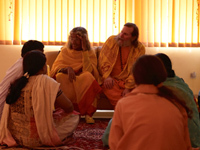 I’m about halfway through performing the 16-week Santoshi Mata fast,and now am starting to get a little worried about how I will be able to get the udyapan performed to conclude the fast. I am supposed to feed eight boys with kheer and gram curry and be sure that none of them eats any sour food for the entire day. I don’t personally have any boys to invite/feed, and have no one among my family or friends who would understand or partake of this kind of thing. Does Swamiji have any suggestion on how to perform this udyapan? Is it possible to have this done at a temple in the US or India, or is there an alternative ceremony that I could do that doesn’t involve feeding Brahmin boys (since I don’t know any)? I have a question about Santoshi Maa. Im confused as to whether she is a Devi conceived by the popular bollywood movie of the same title, or if there are historical references to Santoshi Maa before the movie. From what I had read, I had understood that the former was the correct assertion. I was watching a program on Santoshi Maa and it was mentioned if one kept a fast for 8 continuous Saturdays, Santoshi Maa has never failed to give her devotees the desires of her heart. Could you please give me more information. In this article, Swamiji stresses the need to do make worship of all the daily influences everyday and the beneficial effects of worshipping the nine planets. Question: Swamiji, what is the attitude that one should have when facing adversity? In India, the priests suggest pujas (worship) to Shani (Saturn) to make things normal again. What do you think? Swamiji: I think that we should make puja (worship) everyday, and not just for Shani but for everybody, everyone that’s Divine, and all the Divine influences in our lives. Now, what happens in India is that, generally, priests know that householders are so busy with their worldly tasks that they’re not making puja, and their neglect of the pujas is what causes confusion. So most of the priests in India who suggest that you worship Shani are really saying, “Get on a spiritual path.” For anyone who’s really on a spiritual path, you have no need for a priest who says to do a puja for Shani. You’re doing puja everyday yourself. What need have you for a pujari who says, “It’s Shani dosha (affliction) that’s causing your problem”? Shani has many benevolent effects in our astrological ecology. Shani is the Lord of discipline. Shani is a very great benefactor to anyone who creates a discipline. He is the strength of that discipline, and the focus of that discipline, and the commitment to that discipline. And now we are seeking freedom through action – not freedom from action. The moksha that we are seeking is freedom in action, not being inactive. The verses in the Bhagavad Gita say, “No one can be free from action. Even I who am the Lord of the three worlds, I must continue to act.” Therefore, do your action with the spirit of the rishis (sages). Do your action as the servant of Ram, do your action as an instrument in the hands of God. So I appreciate the priests of India who recommend that we do Shani puja or the like, because they’re really saying, “Do something spiritual.” But I appreciate even more those great sadhus who are doing it themselves, not because some priests in India told them to, but because they are really in love with God. And they are following this path just as an inspiration so that they lead a pure life, a focused life, and a disciplined life which brings them to their ultimate objectives. Graha shanti (peace) is to put to all your planets in harmony. Now look, the Sun is the light of wisdom, the Moon is the warmth of devotion, Mars has strength and fortitude and focus, Mercury is the communicator, Jupiter is the great guru and teacher, Venus fills us with love and pure attachment, Saturn will take us to discipline, Rahu and Ketu polarize obstacles and help us to reconcile the opposites. Look at the beneficent aspect of the planets and then they’ll all be in shanti. That’s the puja.